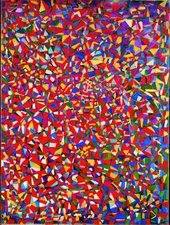 A key figure in Turkish modernism, Fahrelnissa Zeid was the one of the first female students to study fine arts in Turkey. 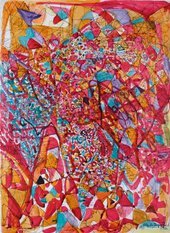 After marrying into the Jordanian royal family, this artist princess went on to travel the world, attending art school in Paris and exhibiting in London. 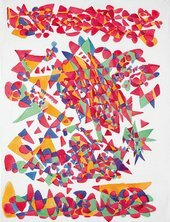 Through her long career Zeid explored many different styles and experimented with a range of techniques and materials. 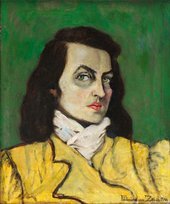 To coincide with her retrospective at Tate modern, we take a look at four of her artworks. 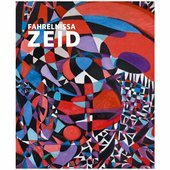 This painting represents a turning point in Fahrelnissa Zeid's practice when she was moving away from figurative art towards pure abstraction. Here we can see faces and hands, including a clenched fist, fighting for space in the picture frame, accentuated by her use of black lines that allude to mosaics and stained glass windows. 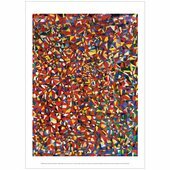 I did not ‘intend’ to become an abstract painter; I was a person working very conventionally with forms and values. But flying by plane transformed me … The world is upside down. A whole city could be held in your hand: the world seen from above. Often, I am aware of what I have painted only when the canvas is at last finished. I am a descendent of four civilisations. 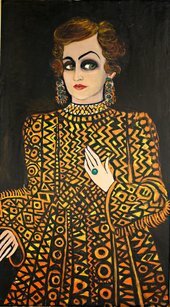 In my self-portrait ... the hand is Persian, the dress Byzantine, the face is Cretan and the eyes Oriental, but I was not aware of this as I was painting it.